The COR Platform will educate employees regarding your commitment to the COR safety principles and how they have been implemented in your company. Your workforce will have the confidence to respond to any questions an auditor may ask. We develop a messaging platform using your companies Safety Management System and the 19 key elements that COR has standardized in an Audit. We incorporate questions your workers and supervisors may encounter during an audit and create messages that are consistent with your program. Messages are transmitted weekly, directly to all employees at a time that does not conflict with any Cell Phone use policies. Yearly we modify messages to reflect all Corrective Actions based on the auditor’s recommendations, keeping the platform current and educational for all employees. A direct line of communication between you and your employees. You have the option to send specific messages regarding a Company Milestone, Safety Concern, Emergency or an upcoming Event. 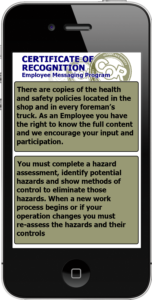 All employees receive the same message creating interaction and discussion on key safety issues within your company. Consistent and repetitive messaging will result in employees retaining the information. The platform has the flexibility to send messages to different employee groups at different times. START SENDING YOUR SAFETY NOTICES TO YOUR EMPLOYEES TODAY Get Started Now! “Our safety meetings are now the best they have been in the eight years I have been at Westcon. Best input and best results. The messaging has made the difference!”Kim Becker, Operations Manager - Westcon Precast Inc.
“The Messages work. Your digital record of the messages is very important to us.”Cory Andrusiw Owner/Managing Partner - Westcon Precast Inc.
“The safety messages are bringing people up around here, not putting them down. This is very good.”Jack Christofferson, Crane Operator - Westcon Precast Inc.
"Everybody gets the same safety messages every morning at our coffee break. Our people are talking to each other all the time about issues in the plant. "Michael Cabral, Plant Manager - Westcon Precast Inc.
Safety Messaging Prioritized TRWA © 2019 Inescapable Messaging Inc.